Christof Innerhofer is a Italian World Cup alpine ski racer, the 2011 world champion in super-G. He competes in all five alpine disciplines and specializes in the speed events of downhill and Super-G.
Born in Bruneck, Innerhofer lives in Gais, South Tyrol. He made his World Cup debut in November 2006, and won his first race, a downhill, at Bormio on 28 December 2008. At the 2011 World Championships in Garmisch-Partenkirchen, Germany, Innerhofer won a medal of each color: gold in super-G, silver in super combined, and bronze in downhill. 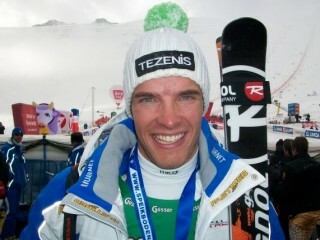 At the first World Cup race following the World Championships, Innerhofer won the super combined at Bansko, Bulgaria. The race was unusual in that the slalom portion was run first, in anticipation of fog; the afternoon speed run was a super G, rather than a downhill. Innerhofer took the silver medal at the Sochi Olympics 2014 in the men's Olympic downhill and celebrated as if it was gold to him. Innerhofer was faster than Austrian gold medalist Matthias Mayer through the first three checkpoints, fell behind by 0.01 seconds — the slimmest of margins — at the fourth interval and then ended up just 0.06 back at the finish. His major satisfaction was to even finish the race, as he struggled with terrible back pain that he doesn't even train during the summer anymore. "This is worth like 10 wins," explained Innerhofer, who has six career World Cup victories — including one in the classic Lauberhorn downhill in Wengen, Switzerland, last season. "This was the only thing I was missing," Innerhofer said. "I'm not one of those skiers who can win the overall or the discipline title. With my health condition that wouldn't be realistic. So I go race by race and today I had my best run of the season." View the full website biography of Christof Innerhofer.